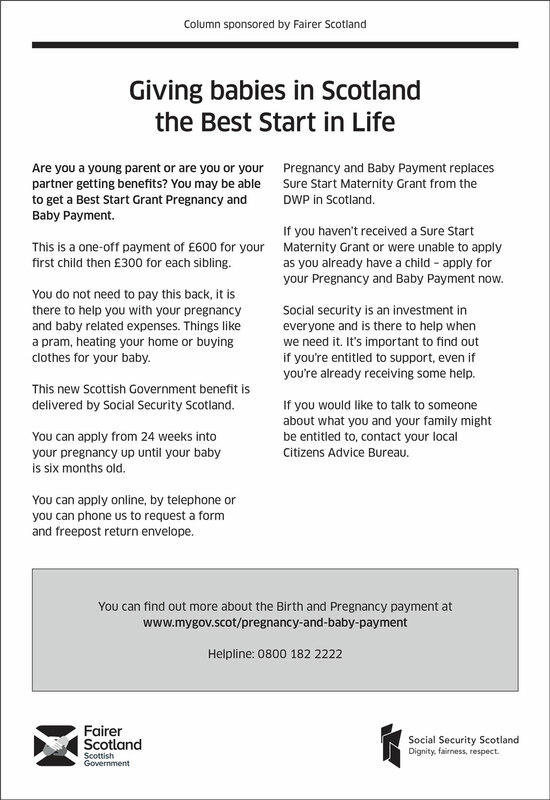 Advertorial: THE FIRST Best Start Grant Pregnancy and Baby Payments will be made before Christmas. This payment also provides £300 for all subsequent children — meaning there is no cap on the number of children it supports, unlike the current UK Government equivalent. In addition to the Pregnancy and Baby Payment, by summer 2019 two additional early years payments will be introduced. The first £250 payment will be made around the time a child starts nursery, to help with the costs of early learning and a further £250 when they start school. Social security secretary, Shirley-Anne Somerville said: “I am delighted we will be delivering the Best Start Grant Pregnancy and Baby Payment earlier than originally planned, providing low income families with increased financial support. I am particularly pleased, that by not capping children, babies born in the last six months who already have a big brother or sister, and had no support from the UK Government because they were not the first child, will be eligible to get their payment. “With the Early Learning and School Age Payments, this means that for a two child family, the Best Start Grant will provide £1,400 – £1,900 more than they would get under the UK legacy benefit. That’s a substantial investment to ensure our under 5s get the best possible start in life and reflects this government’s emphasis on the early years. Connie is 25 and lives in Glasgow; her baby is five months old. “I heard about the Pregnancy and Baby Payment through One Parent Families Scotland, who told me all about the grant and how to apply for it,” she said. “The payment will go toward clothes, nappies and shoes for my son, babies grow so quickly and he’s five months now. “This will make a real difference to me, it’s not a payment I was expecting. It will make life a bit easier, my income stays the same, but my outgoings are higher as this is my third child. My other children are four and five so the things I had for them I don’t have anymore, so I’m kinda starting again.